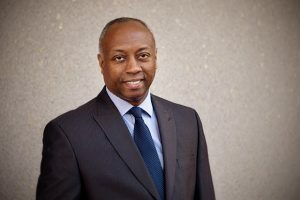 RICHMOND, VA (January 25, 2019) – Terrence L. Graves, a shareholder of the Sands Anderson PC law firm, has been inducted into the Virginia Law Foundation Fellows Class of 2019. All members of the Fellows Class of 2019 were inducted at a dinner and ceremony on January 24th at the Williamsburg Lodge & Conference Center during the Virginia Bar Association’s annual meeting. The Virginia Law Foundation Fellows program was created in 1983 by its Board of Directors to encourage and recognize excellence in the practice of law and public service and to support the programs and objectives of the Foundation. The current Fellows membership is nearly 500. Graves earned his law degree from the University of Virginia and his undergraduate degree from Howard University. He is co-chair of the Litigation Group and chair of the Diversity and Inclusion Committee at Sands Anderson. Graves is a recognized leader in insurance law, particularly within the commercial transportation and trucking industries. Graves is recognized for his high standards, excellent trial experience, and as a leader in the legal community. He currently serves as the 134th president of the Richmond Bar Association, the second African-American to hold this position. He also served as president of the Virginia Association of Defense Attorneys from 2007-2008. He was inducted as a Fellow of the American College of Trial Lawyers in 2012 and became a Fellow of the Litigation Counsel of America in 2007 and then a Senior Fellow in 2015. Graves is also a member of the Federation of Defense and Corporate Counsel and currently serves as the Transportation Section Chair. He is a steering committee member of the DRI Trucking Law Committee and previously served as a state representative. Graves is rated AV, the highest possible score in experience and ethics, through the Martindale Hubbell Peer Review rating system. He has been listed in Virginia Business magazine’s “Legal Elite”, Best Lawyers in America®, and Super Lawyers®. Graves is a frequent lecturer at the local, state, regional, and national levels presenting on Virginia procedure, transportation law, trial tactics, legal technology, general liability, landlord/tenant law, and other topics. From 2003-2006, he was an instructor for the Virginia State Bar – Professionalism Course as appointed by Chief Justice Hassell. Other Sands Anderson attorneys designated as Virginia Law Foundation Fellows include, L. Lee Byrd (Class of 2018), Daniel M. Siegel (Class of 2017), Pierce M. Rucker (Class of 2015), C. Thomas Ebel (2014), Phyllis C. Katz (Class of 2011). Frank “Bunky” B. Miller, III (Class of 1999), and Douglas P. Rucker, Jr. (Class of 1998).